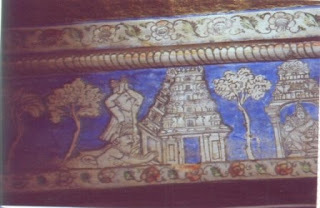 The second temple in the Tiruvarur temple tour is Vilamar Temple. This is locally called Vilamal Temple. The Lord here is Lord Shiva and he’s called Patanjali Manoharar. The Ambal here is Goddess Madhura Bhashini aka Yachinum Men Mozhiyammai and that means ‘The one with the eyes slender than the musical instrument yarp’. The temple is east faced. 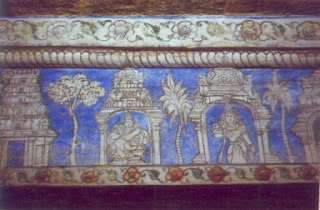 This temple is denoted in the Saivaite Hymn book – Thevaram. This temple has been worshipped by Saint Patanjali and Saint Vyagrapadhar. Saint Patanjali has a body of a snake and human head and Saint Vyagrabadhar has a tiger’s body and human head. An important feature in this temple is the ‘Idadhu Paadha Darisanam’, which is essentially the darshan or the viewing of the left foot of Lord Shiva. When the Lord is in the Ardhanaari form (that’s half Shiva and half Ambal form, the left half belongs to Goddess Ambal. So the ‘Idadhu Paadha Darisanam’ essentially means viewing Ambal’s foot. This special viewing is on the day of Thiruvadhirai which is the Nakshatra (star) of Lord Shiva and this is the very day when Lord Shiva and Ambal are in the united Ardhanaari Form. According to the English calendar, this day falls somewhere in the end of December to the first week of Jan of every year. This temple is a specialty temple for wedding like Kalyana Venkatramanar Temple, Karur and Kalyana Perumal Temple, Chennai. Also childlessness is believed to be cured here. The temple tank is called Agni Theertham. 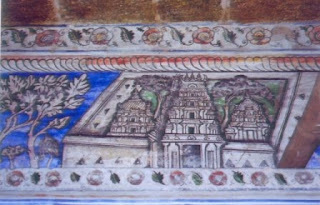 The ceiling of the temple has several panels of paintings about the history of the temple, essentially in black & blue. These paintings are not very ancient but not very new as well. I believe these must be Nayak Period paintings. Forgive me for putting up many pics of the temple on the whole. The paintings I’m putting up here are essentially of the paintings only!!! From Tiruvarur to Vilamar: 2 km to the west in the road to Tanjore/Thanjavur. This post of yours explains my earlier quiries. This is interesting.. didnt know about all these temples... waiting for more! gr8 work capturing them !!! I enjoyed reading this very interesting post written with so many details and clarity.It was like visiting the temple with you.You are a wonderful tourist guide and a specialist in temples.It is amazing to see that you take exceptional interest in taking us to less traveled places and each post you write is an education for me. The paintings are gems. Thanks. Am glad to have introduced this temple to you. Coming soon with more on Tiruvarur. Thank you so much for your wonderful comments and appreciation. Great going Bhusha. Avid and Vivid travelling. only if it would have been earlier i wouldnt have missed this when i went to Tanjore. திருவாரூரிலிருந்து இயங்கும் மைதிருவாரூர்.காம் என்ற வெப் சைட் உள்ளது, அது எல்லாருக்கும் தெரியாது என்று நினைக்கிறேன். Some of the other Specialities about this temple that I found in the recent visit are- The Vinayaka Statue here has a Third Eye in the Forehead which is very rare & there is also an exclusive Maha Lakshmi Sannathi here. I went there on a Thiruvathirai Day & participated in the prayers. It was a Unique experience! Glad that you went there and enjoyed your visit. Thanks for dropping by and for the extra bit of info.